One of the most important responsibilities facing higher education today is creating and promoting a diverse campus. As the college landscape continues to evolve, institutions must provide more opportunity for students from all types of backgrounds. This makes it even more essential for colleges and universities to reduce bias in the hiring process to help promote diversity and inclusion at their institution. 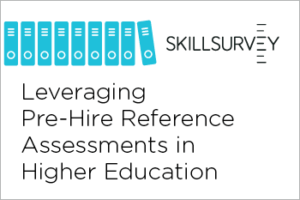 Download the whitepaper to learn more: Leveraging Pre-Hire Reference Assessments to Reduce Bias in the Hiring Process and Promote Cultural Diversity in Higher Education.